This the season for celebrating the holidays with friends and family! This past Saturday my husband and I went to his work Christmas party. We were asked to bring dessert so I thought I would finally try doctoring up a cake mix. I’ve seen many post on Pinterest about making cake mixes taste like a bakery cake. I was able to do just that. Another win for my Pinterest Sweets board. Make your cake as directed, but use hot water, add 2 extra eggs, and use melted butter instead of oil. You will not be disappointed. Very dense, moist, and rich in flavor is what happens when you make these simple changes. I don’t think I will be making cakes from scratch anymore. Beat all ingredients except mint pieces to stiff peaks. 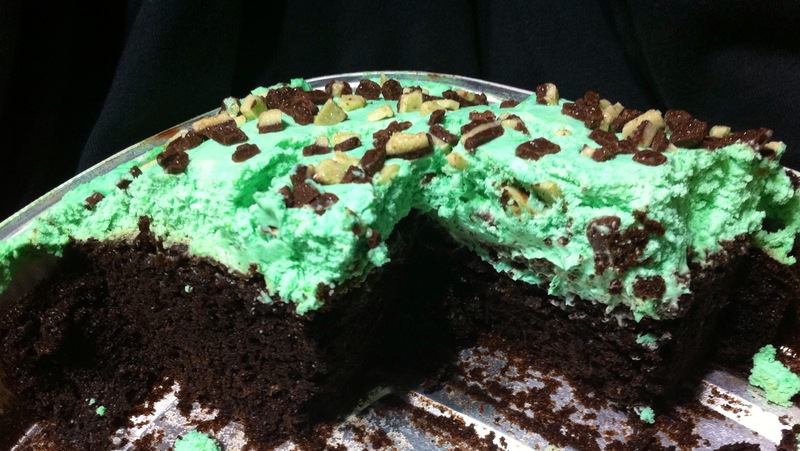 Frost Cake and sprinkle mint pieces on top to your liking. It taste just like thin mint cookies!